Is your car pulling to one side? Could be an alignment problem. Have your wheel alignment checked at Lenny's Tire Service. Often confused, both wheel alignment and tire balancing have a significant impact on your tires. Wheel alignment and balancing issues will result in more wear and poorer overall vehicle performance. Wheel alignment basically entails adjusting the angle of the wheels to what is recommended by the vehicle manufacturer. Alignment may also be referred to as front end alignment or tire alignment. We have precision equipment to ensure proper tire alignment for your vehicle. To avoid steering problems and tire damage, proper wheel alignment should not be neglected. We will provide alignment evaluation and make sure that you are back on course in no time. Contact us today to set an appointment. Why is wheel alignment important? It is essential to maintain the precisely set positions of the components of your auto suspension system for maximum wheel and tire performance. Potholes or bumps in the road will jar your car out of alignment, resulting in steering instability and a rough ride. Wheel alignment issues need to be immediately addressed to keep the vehicle from developing long term problems. As soon as you see signs of uneven wear on your tires, bring your vehicle in to be checked for faulty wheel alignment. Precision wheel alignment service does not take long, and goes a long way toward preventing more complicated problems down the road. Remember that wheel alignment is an especially important consideration after collision damage. The impact can quickly knock your vehicle drastically out of alignment. When having repairs addressed, a wheel alignment may also be necessary to put your vehicle back on track. 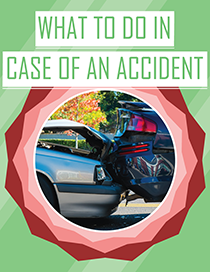 Download our quick and easy-to-read Car Accident Help Sheet in case of an emergency! Check us out for news and special offers. Follow our Google Plus page.